The third in the Jesus & You series, a four session, DVD-based course about God's kingdom. In just four sessions, you can hear seven of these stories of Jesus. Find out why our world is full of trouble, how the message of Jesus can completely change your life, and what’s the greatest treasure in the universe! This straightforward course will bring the teaching of Jesus to a broad range of people, including those who normally have difficulty accessing the Christian message. No previous Bible knowledge is assumed. Each session is based on a modern, easy-to-understand translation of the Bible. Using the down-to-earth skills of two experienced Christian communicators—Pete Woodcock and Lizzy Smallwood—the DVD presentations explain and apply these stories of Jesus in a colourful and memorable way. A real-life story at the end of each session shows how Jesus still changes lives today. Each session is presented by both Pete Woodcock and Lizzy Smallwood so that you can choose the presenter most appropriate for your group. 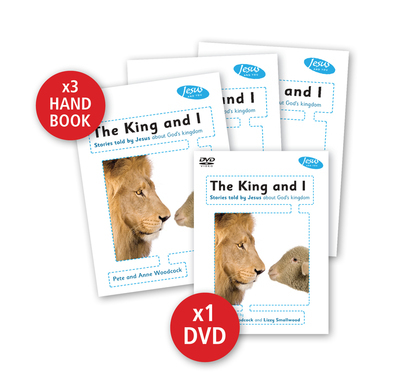 Use the DVD of The King and I alongside the accompanying Handbook. (A free downloadable Leader’s Guide is also available). These resources will help you unpack some incredible stories told by Jesus, and introduce ordinary people to who Jesus is, why he came, and the difference he can make in our lives. BRAND NEW! To help with promoting your course, we now have posters and invitations available for you to download. See the 'Extras' section on the top left-hand side of the page. Bought this on spec to use in our summer bible study group. It worked really well with our men's group and also with one of our cross cultural ladies' groups. The material is uncomplicated but very powerful. The study sheets are workable and lead the group into the detail of the story and the videos work really well to highlight the issues. Surprisingly found that the studies stayed with me and influenced my thinking. These studies are a great way of getting groups who have just started on their way with leaning about Jesus to get into important details. People who have been walking with Jesus for a long time will also be challenged to re-examine what Jesus says about a lot of our every day lifestyle choices. We are using "The King and I" with International students studying art at UCA Farnham , and they are really loving the material. We have had some of the best discussions on Christian truth as we have used the material. The explanations from Pete and Lizzie are first-class, clear and punchy. And the testimonies root the truth in personal experience. Just started running my second course using the Jesus and you material and have found both the "Tales of the unexpected" and "The King and I" to be really good for the groups they are aimed at, folk with little or no previous Bible knowledge. The video's are engaging however don't expect the same high production values as the CE video but they work well with the material. I'm so pleased that material like this is being produced and I hope that more are in the pipeline.